This top notch facility makes ordinary meetings extraordinary! The venue is designed for effortless set-up and tear down and is capable of handing significant electrical, utility and communications needs. Attendees are given a dramatic views of world-class attractions: AT&T Stadium, Globe Life Park, Texas Live! and Six Flags Over Texas. At break-time, attendees can refresh on our walking trails with a tranquil waterfront view. The venue features an on-site chef that offers award-winning, customized catering from a full-service banquet kitchen. Our attentive service, of course, is always on the menu. Location, location, location. 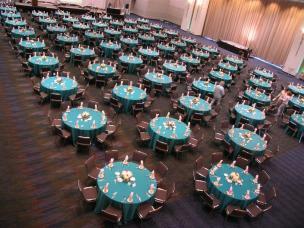 Meeting planners know that location is the main ingredient of a successful meeting, convention or trade show. Arlington makes it easy on guests and planners! Click here for complete specs for our convention center, which is centrally-located between Dallas and Fort Worth, 15 minutes south of Dallas/Fort Worth International Airport.